Everybody needs a pamper once in a while, and at our luxurious spa and hotel we have everything you need for a weekend of pure bliss. Based near the Norfolk and Norwich areas, we’re less than half an hour from Thetford! Enjoy our tranquil atmosphere and calming vibes as you enter our peaceful retreat and forget those worries and stresses. With a range of days, breaks and packages available, there’s a spa experience to suit everybody! If you’re based near the Norwich and Norfolk area, then this is the ideal escape for you. Based in the heart of the Suffolk countryside in a stunning Georgian building we have an abundance of facilities to leave you feeling calmed and refreshed. Our rooftop hot tub is a popular feature at the spa, wind down and soak up the bubbles and enjoy this experience with a loved one or friends! Then why not check out our impressive hydrotherapy pool? Feel those muscles loosen up as our water jets take care of any tension in your back and shoulders. Then it’s time to warm up! Our heat experience at the spa offers a lavish sauna and steam room area to wind down and enjoy. And why not visit our private rasul rooms for a mud treatment? Detox and cleanse your body with an array of different muds. Why not extend your day with us and make it into a break? Our spa breaks and packages are the perfect way to spend a relaxing weekend. Slip into luxury at our four star hotel with king-size beds, contemporary rooms and various suites available. 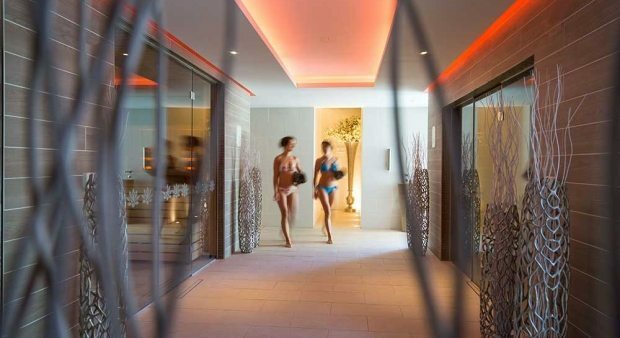 Our spa hotel not only offers luxury but you’ll also enjoy a complimentary pass to our leisure suite as well as access to our award winning hotel restaurant and bar area. As well as our weekend breaks and packages, we also have various spa days for a burst of relaxation. Choose from our luxury spa days for two, champagne spa days, relaxation days and more! View our full range of spa days and spa breaks. Just 30 minutes from Thetford, in Newmarket our luxurious spa awaits you.